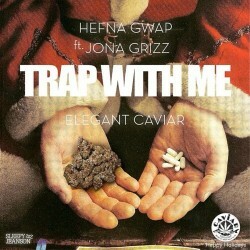 While all Mariah wanted for Christmas was you, Hefna Gwap and Jona Grizz were all about bad females this holiday season as they dropped “Trap Wit Me”. The Cali bred emcee grew up in East Palo Alto and these roots inspired the title for his current mixtape EPA. A member of Smokers Club, Gwap boasts an impressive 100,000 listens on SoundCloud which is an impressive feat for an indie artist. “Trap Wit Me” is a no holds barred blast of aggression and it’s spooky trapped out aura is intense as hell. Imagine Waka Flocka hosting an exorcism and you get this Manny McPlanes produced hood nightmare. Since making his move to Brooklyn, the creative rapper has represented a collective called Elegant Caviar, a term which represents the good and bad sides of his life, tracks like “Trap Wit Me” further this message by combining lavish celebration with rough edged ruthlessness. With a heavy mixtape thuggin’ around the internet and weekly #westblockwednesdays releases consistently impressing, Gwap should expect more success in the new year. Elegant Caviar and Kevin Sinatra to go all in with "1160"
Hefna Gwap – "Violence & Sum Knowledge"